For over a year now I have been tracking a lot of variables which I think play a huge aspect in my life. I have just been tracking a lot of things. I did not track these things for the pursuit of happiness, I just wanted to increase my knowledge about my life. And of course, happiness plays a huge part of my life, it is the end product of life. Everyone is on their individual level on the pursuit to happiness. Happiness can be achieved in many ways, but many things can also keep you from being happy. Is it diet? Is it less physical activity? Is it social interaction? I don’t exactly know. Everyone has an opinion about it. We got the health freaks, the exercise fanatics, and the psychologists all telling us something different. Should we life a super healthy lifestyle to become happy? Or should we just go out with some friends to make us happy? I don’t know the right formula. If I go exercising – which would make me happy – I can’t hang out with my friends. But with friends I am more likely to eat less healthy. Sometimes, it is the one or the other. You can’t have it all. Therefore, to understand my happiness, I should approach it with a holistic view. A wide spectrum of several (broad) constructs need to be measured and analyzed. For gaining knowledge on which are the most important constructs for a happy life. On a daily basis I’ve been tracking several constructs which I assumed that could have influence on my happiness. I know there are broader constructs which play a huge part in my happiness, such as income, marital status, and illness. However, these constructs were quite constant during the tracking period, so I did not use them in this experiment. The constructs I measured and used for this study can be seen in the next table. The table shows how many days I have been tracking this construct. There is variance between the number of logs between the constructs, because some days I forgot to track a construct. Next to this, I started to track several constructs later on. Every evening I have a diary using the Taplog app. I give a lot of constructs a rating, most of them with a scale of 1-10. This is highly subjective, but then again, most of these constructs are highly subjective. When I rate loneliness for example, it is my feeling of being lonely, for others loneliness could mean something different. In future blogposts I will focus on these subjective vs. objective measures (e.g. productivity, activity, stress, sleep), but not today. I know that my happiness can change within a day; I can be happy the whole morning, but a sudden event can cause sadness the rest of the day. Considering this, I tried my best to log the average happiness score over the day. I know that there will remain some variability, as a result of this averaging out effect. The first thing I wanted to graph, was the course of my happiness over the year of tracking, as you can see in figure 1. Two things stand out when understanding this graph: there are two wider peaks where my happiness significantly increased. I surrounded them with two black squares, these were periods that I was on a holiday. So first thing to conclude, I become happy from holidays (well duh). The second thing to notice is that the period before the first holiday, I was less happy than after the holiday. I can explain this because during this period my beloved girlfriend was studying abroad. I definitely missed her, this made me feel lonely which, as you can see, decreased my happiness. We reunited at the first holiday in Indonesia so happiness was touching the roof there. Figure 1. 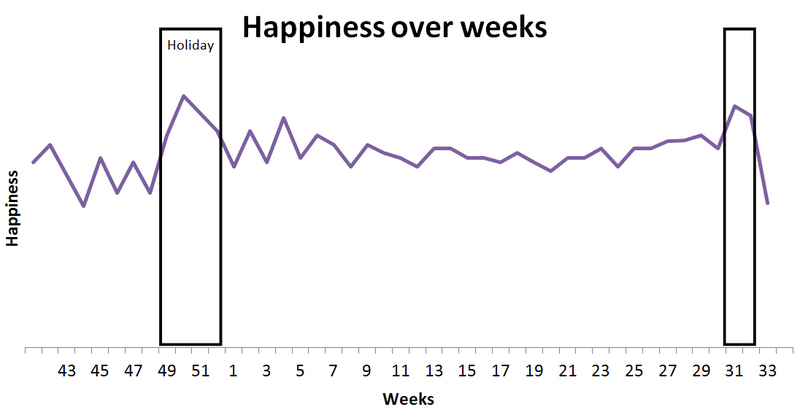 Week averages of happiness over time. Black squares indicate holidays. In holiday circumstances, I am in a complete different environment and do different things compared to normal life (e.g. social interactions, activity) so this will alter the outcomes. For this study, I was eager understand what makes me happy in my daily normal life. So for the rest of the analyses I excluded my holidays out of the dataset. Using a statistical tes the “One way Anova” I found no significant difference (p=0.406) in my happiness between the days of the week. On average, Thursday is surprisingly my happiest day, however due to the variance, this result was not significant. So “Thank god it’s Friday” doesn’t apply to me. My weekends aren’t that much better than weekdays. That’s a good sign in my opinion. 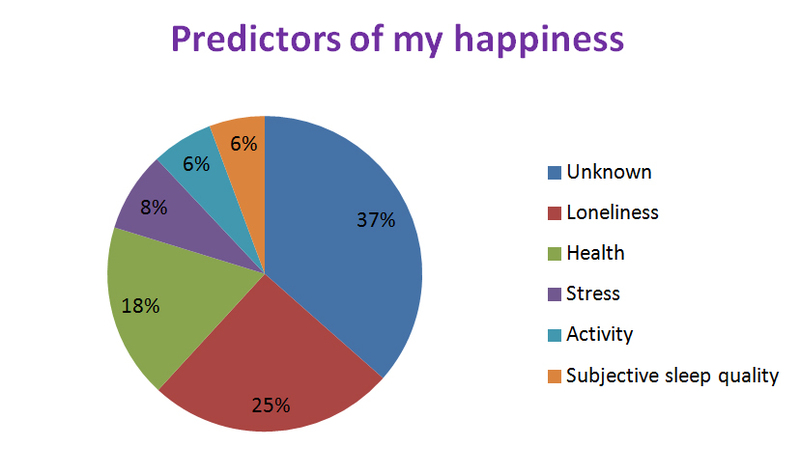 To analyze the predictors of my happiness, I need to have a subset of constructs which are these predictors (table 1.). For this I used a Backward Linear Regression analyses. With this statistical method, you try to explain the dependent variable using the predicting variables. With the dependent variable (happiness) and the predicting variables (mentioned in the table), it tells you how much they explain my happiness score. I’ve checked all assumptions and the results can be seen in the next pie-chart (figure 2). I can explain 63,4% of my happiness with the variables I used using this model (R2 = 0,634, F(5, 65) = 22,49, p < .001.). Loneliness is the strongest negative predictor of my happiness, and the second strongest is Health, which is a positive predictor. However, The rest (36,6%) are unknown variables. And after the first holiday? I excluded the period when my girlfriend was studying abroad to control for the long term absence of my girlfriend. Loneliness remained the strongest predictor of my happiness using a regression analyses. So in general, loneliness is the strongest predictor of my happiness when all factors are “normal”. Season 2014-2015 was a season with ups & down’s. Overall, I can conclude that most of my happiness is dependent on loneliness. My highest ups were when I reunited with my girlfriend in Indonesia after 5 months of separation. The factor Indonesia could also be of some influence here. However, after Indonesia my girlfriend came back from studying abroad I became significantly happier. This concludes that my happiness is (for a large part) dependent on the presence of my girlfriend. Second in line comes health. Being healthy contributes to my happiness as well. I never was substantially Ill for a longer period in the season 2014-2015, so this means that the feeling of general healthiness is important for me. Well, “don’t be lonely” is a horrible advice, you don’t have a direct say in whether you are lonely or not. What I can say is that I was less lonely when my girlfriend was not studying abroad. Second I can say that for me, loneliness has a negative relation with social interactions, health, and physical activity. I you have more control over your girlfriend than I do, just force her to stay with you. That will definitely make you happy (haha). Second, try to find substitute activities, in my case this would be other social activities, better health (see eat healthy), and physical activity. In my study and job, it is my work and job to make people feel healthy. Although feeling healthy is very important for happiness, feeling lonely is more important for happiness. This applies to me, but I am sure this applies to most of us. However, I don’t see many interventions which are anti-loneliness programs. There could be programs which promote finding love, or help you to find friends if you are feeling lonely. Of course there is Facebook, and several of dating websites that facilitate these things, but they do not really help you with it. Most of it you have to do yourself. For example, if you just broke up, or you feel intensely lonely, this is not an excuse for anything. You cannot call a few days off from work because you need some time for yourself to weep about your loved one. However, you can get days off when you are not feeling healthy. You’re not physically cracked, just mentally. I have the feeling that this aspect is underappreciated in our modern society. Love and loneliness is seen as something in our private sphere, you don’t discuss this part of life that openly with everyone. I think there is a need to highlight these aspects of life more openly in the future. First of all, this study was about short term happiness on a daily basis. However, happiness on a weekly basis shows comparable results (not shown). In the long term other constructs like health/sickness might be more prominent. Secondly, all analyzed constructs are highly personal and highly subjective. I am a wealthy, Caucasian western young adult. These things alone should make me happy on its one. Of course we cannot generalize this study. Thirdly, this study is season dependent, a girlfriend who studied a half year abroad had a huge impact on my life. Next season things could be very different. I give you a quote from Martin Seligman concerning this dimensions: Positive Psychology takes you through the countryside of pleasure and gratification, up into the high country of strength and virtue, and finally to the peaks of lasting fulfillment: meaning and purpose (Seligman 2002, p. 61). In my tracking I just have one dimension “happiness”. I think it’s worth it to separate happiness in these three dimensions to understand how my life is composed and to understand what I can reach in the future. Personally I am eager to increase the meaning and purpose of my life. And I think tracking these constructs is the first step towards it. Mooi om op deze manier inzicht te krijgen in wat gelukkig maakt. Het is ook goed om op deze manier te kunnen kijken, zodat het ook anderen kan ondersteunen met de dimensie “happiness”. Juist door te meten wat het voor jou betekent en betekent heeft; kun je anderen bewuster laten kijken naar hun eigen manier van leven.